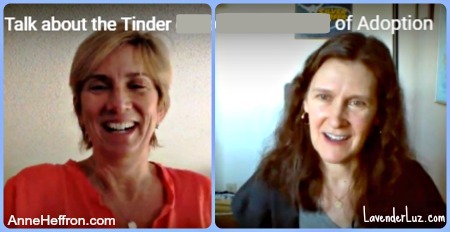 If you want to be a fly on the wall, watchour conversation about the concept of swiping right or left in adoption. The tagline: Parenthood is just a swipe away. Who exactly are the “adoptable kids” this app wants to be the search engine for? The idea of a marketplace for adoption, and why that feels so skeevy. Two ways Adoptly is different from Tinder. On falling in love with a photo. Is eventual widespread use of such an app inevitable, the way eHarmony and Match proved to be? Anne’s biggest fear about this app. After consideration, our final verdicts on Adoptly. That all said, how apt are you to use Adaptly? Anne has written her own reflective post, Dating Babies, about swiping for children. Hmmm. Does anyone really think about when these babies grow and want to know their story? Imagine telling your child they were found on an App? It’s all too sad. Then imagine being an older child who is well aware, and realizes they are being passed up for a better specimen. People,people, people these are humans we are talking about. Think. That aspect seems to have been missed, that these are humans involved. And unlike with Tinder, these humans are not there by choice. I have so many thought… Anne, you are so right, “This is shopping.” Ewww. commoditizing human beings. losing track of the priority of “Finding families for children” as opposed to finding children for parents. Where will the “vetting” be to ensure that ONLY people who’ve adequately screened and EDUCATED on adoption & trauma are permitted to adopt. Adoption is not a right; it is a privilege. Adoption by checkbook or website eliminates important safeguards and leaves children woefully unprotected. Like your question of “What would be acceptable?…” Adoption is not an interaction of equals which complicates the picture even more. My concern about the app is that it makes it easier for people to avoid the hard work of preparing for and creating an adoption. Bottom line: in many ways I think we need to proceed more cautiously and less expeditiosuly to ensure that th placement is sound, and creates a family for a child that is suited to the child as opposed to appealing to the adoptive parents. When I was a prospective adoptive parent 30+ years ago, I operated through a lens of “baby hunger”. Through the efforts of our agency, we grew empathy & understanding for both birth parents and children and the first seeds of “adoption-attunement” were planted. It has taken me a lifetime to understand how complicated adoption is, how essential education is and how much more we must do to ensure national standards for adoption education for parents and professionals. Agreeing with everyone above. The creators of this app are clearly coming from this from a consumerist perceptive. They aren’t considering that adoption is more than a transaction and that it’s more than the initial matching of child with adoptive parents. If nothing it demonstrates how desperately we need to educate the general populous about what adoption actually is instead of the fallacy so many have in their minds. Exactly what you said, Gayle. It puts the focus on “filling the crib,” when, as we know, that is not the endpoint but the beginning point. There is MUCH parenting prep that comes after that. Thanks for the discussion Lori and Anne. The concept of Adoptly (weird name) exploits both voiceless children and biological mothers/parents. Not to mention the App would be available to everyone…creepy. Let’s continue to work toward child-centric, truthful, transparent and educated ways to make families. Apps are good for some things like checking the weather or listening to NPR but swiping left or right to accept or reject a child shouldn’t be a reality. I read about this last night and I still can’t decide if it’s for real. The video sounded so clueless that it bordered on parody if it wasn’t all the way there. I didn’t believe for a moment that any of those project starters were parents, let alone adoptive parents who might know about at least that side of that experience. When adopting waiting children, there is no getting around some kind of matching process. It’s not realistic to expect a family not to have parameters concerning age, special needs, number of children, etc. After reading about Adoptly, I looked at waiting child listings in our region to try to compare the experience. When it comes to older child adoption, that part of the process isn’t all that different. We used to look through booklets; now the photos, writeups and videos are online. Although the symbolism of swiping yes or no is repellent, clicking on one photo rather than another online or pointing at one in a book isn’t that different. The whole situation is a judgment on our priorities as a society. Many if not most of those children would still be in their original families if we supported families better, but they are here now and they need homes. Some children who desperately need families do find them through that process. Most children who are on those listings, however, have multiple challenges and are at least school age if not teenagers. Younger, healthier kids already are finding families without the need for a silly app, and infant adoption wouldn’t fit under their guidelines as far as I can tell. So what’s the point? I’m so glad you spoke to the point of photolistings for waiting children. In this case, maybe the app could be made workable because the basic process is very similar, just more efficient. No. I would not use this app. I love the thoughtful conversation between you and Anne…I have many of the same concerns. Ick. Kickstarter has suspended funding- hooray! I’m glad they suspended it. Yet, as you and Anne discussed, something akin to this is probably inevitable. There are so many grey squishy aspects of adoption/reproductive technology which i find difficult to wrap my brain around: “snowflake” adoption (frozen embryos”. surrogacy both donor and gestational, sperm and egg donation. All of these commoditize children in order to fulfill an adult’s need. So little thought is given to the prospective child being created. In s many ways it feels like playing God. Believe me, I get baby hunger. I was there. It was inconceivable for me to contemplate a childless life. Still so many of these advances leave me squirming and struggling to discern where the moral path lays. Thanks for the great conversation which you & Anne shared. I appreciated how you tried to really dissect the issue, identify pros and cons before you came to a conclusion. Great job!. I love how you and Anne both think and write–glorious, impassioned & thought-provoking. You both cast brilliant lights that help dispel darkness and ignorance.